at the picture below you will see a set of Top plate until stripper plate design related with runner flow, at this picture support pin exclude. the mold type in this picture is 3 plate type. the runner system accommodates the molten plastic material that coming from barrel, and guide it into mold cavity, the dimension, configuration, shape, and system connection with mold cavity will affect filling process. as see from that picture, red plate indicate isolated plate, it's doesn't matter you use isolated plate or not, but you must see more in injection machine, if it needed isolated plate give it. number 1 and 2 in black plate it's indicated top plate for number 1 and stripper plate for number 2, those picture shown 3 open mold type. after injection, in ejection process stripper plate will open because puller bolt pull it( not include at those picture). runner ejector set will needed to push runner, after ejection, but if you use arm robot or manual take the runner by hand operator it doesn't needed. 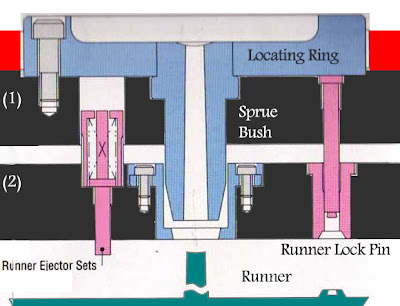 runner ejector set always contains spring, those spring will push pin in ejector set and will push the runner. runner lock pin function is to pull runner when ejection begin still in top plate, if runner adhere in stripper plate, the robots or operator will difficult to take the runner, because no ejection system for runner in stripper plate. when design the runner system and ejection system for runner in 3 plate type of mold you should use those mold accessories.